There’s been a lot of talk about how Obama “swept” the election, and “recolored the electoral map”. It’s true he did well in the electoral college configuration. The electoral college dominates our picture of US elections because, strategically, it’s the only thing that counts. But it’s meaningless as a measure of people’s political values, except as a very dim surrogate of actual vote tallies. 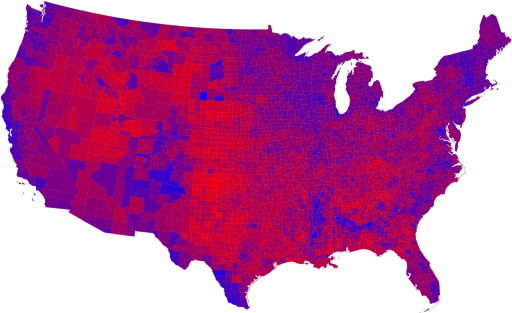 The electoral college system typically has the effect of magnifying small differences, as is the case this time around. How much did Obama really win by? Around 6%. Granted, US presidential races are historically tight; Reagan’s 1980 “landslide” was less than 10%. But before we decide that we’re a changed nation it’s worth considering that out of every 20 voters, 11 chose Obama and 9 chose McCain. That’s very, very close. In sum: whatever the democrat:republican ratio was for a given state last time is pretty much what it was this time. Except for Hawaii. Go Hawaii! Mark Newman was up through the night of the 4th cranking out fresh versions of his now-famous linearly-coloured and cartogram maps of the election results. He’s removed outlines from his polygons, for which I give him 2 extra marks on his map. But otherwise the differences are subtle. I don’t mean to be a buzzkill, and if you read more of Andrew Gelman’s stuff it looks like there really were some interesting demographic shifts. But Obama got on to some pretty lofty rhetoric there, and some of dialogue around his possible presidency and what it meant for America got pretty loft in response. We’re still in the same country here. It’s also worth noting that despite promising transformative change for the better, Obama’s presidency is likely to be more about navigating bad change (pending world-wide recession), pre-empting future bad change (global climate, uh, change) and cleaning up bad change from administrations past. And he’ll have to do it with reduced resources and reduced international trust. Which is one of the reasons I’m glad that the subtle shifts in political values the country has gone through tipped things the way they did. I suspect Obama may be just about the right guy for the careful, gentle, disciplined, undramatic presidency his bombastic campaign poetry signed him up for. pleasure especially for those who merely love the natural beauty. arranging what to do in their spare time. A festive potluck meal, tree trimming party or other holiday event would probably be much appreciated.